Well begun, as they say, is half done. By that measure, startups that managed to raise funding from marquee investors such as Sequoia Capital, Matrix Partners and Helion Ventures even before they began to earn revenue would surely have been on the path to success. But, a beginning however great is just that—a beginning. And startups and investors have now realised that there is much more to success than just money. So, after the frenzied investment activity in 2015, this year offered a reality check as a funding crunch tightened the noose on startups with no clear business model or differentiation from rival ventures. At least 32 startups reported shutting down their operations in the first 11 months of 2016 compared with 17 in all of 2015, according to a Techcircle analysis (see graphic). This means one startup closed shop every 10 days in India this year. While shutdowns increased, fewer tech startups attracted funding. The number of angel, seed and venture capital funding in 2016 for tech startups fell to 668 from 903 in all of 2015, according to VCCEdge, the data research platform of VCCircle. This means that for one tech startup that shut shop this year, there were 21 funding deals. This compares with one shutdown for 53 funding deals last year. The total value of disclosed deals slumped to $1.5 billion so far this year from $4.2 billion in 2015. The list of startups that closed is by no means comprehensive as most companies in India, startups or otherwise, do not publicly announce a shutdown. Also, many startups retain their legal identity and only close their core operations before pivoting to an entirely different business. These startups were backed by notable venture capital firms such as SAIF Partners, Helion, Sequoia, Lightspeed, Matrix Partners as well as by angel investors such as Paytm's Vijay Shekhar Sharma and Flipkart's Sachin Bansal and Binny Bansal, among others. "In the startup value chain, high mortality will happen as that is the nature of the beast," says Mukul Singhal, co-founder of Pravega Ventures. Deepak Shahdadpuri, managing director at DSG Consumer Partners and an angel investor, says that most businesses fail about 20 months after their last round of funding. "Given the spike in startup funding in 2014, this is to be expected. Over time the industry will get used to failure and accept it as part of the innovation and the startup process," he adds. 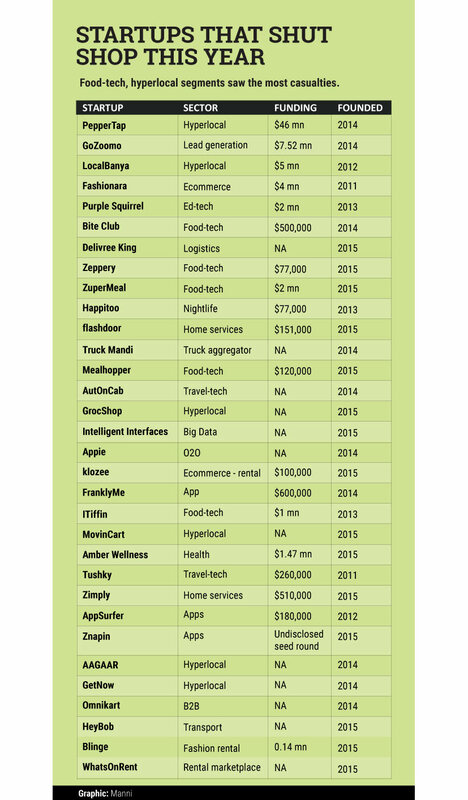 Among the startups that shut down, many were from the food-tech segment. These were followed by startups in the hyperlocal segment. One of the biggest setbacks in 2016 was the shutdown of Sequoia- and SAIF-backed hyperlocal grocery delivery startup PepperTap. Angel investor Ajeet Khurana believes that companies in the food-tech and hyperlocal segments need to pay customers and 'buy' revenue. "That is the biggest pain point they are finding it difficult to solve." Khurana also feels that, although the business model of many startups was flawed, some promising startups also closed as investors took an adverse view of the entire food-tech and hyperlocal sectors. Shahdadpuri believes that one of the reasons for the shutdowns is that many companies had no or poor business models. "Startups entered sectors which were very competitive and which could not accommodate more than a few players, let alone dozens," he says. As 2016 nears its end, the list will surely expand. The heavily-funded e-commerce firm Askme is all but defunct and Delhivery-backed hyperlocal delivery startup Opinio has temporarily shut down its operations. Be ready for more pain.